I've never really ventured into colour liquid eyeliners, I've always stuck with a classic black. 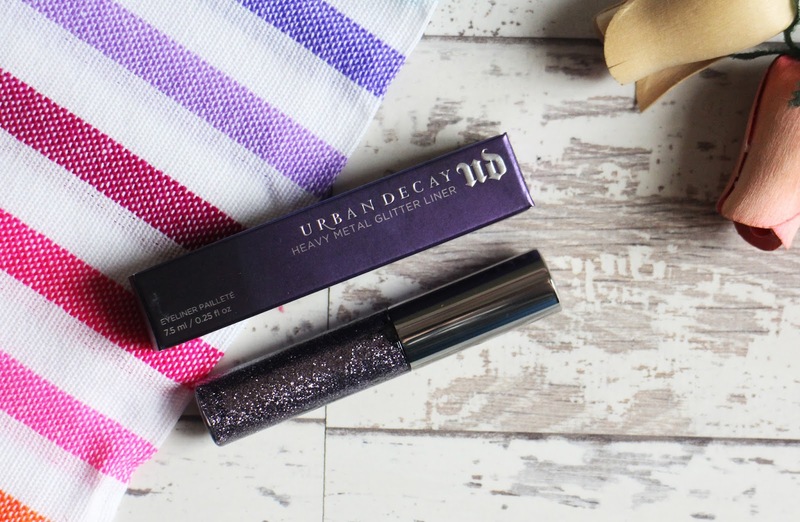 Urban Decay have a massive range of colours in this gorgeous almost metal style packaging - like seriously, it's so pretty! I received the colour Goldrush which is beautiful, as the name suggests this is a stunning golden shade and it's really pigmented. I really want to try and learn to apply this on top of my black eyeliner and get that double liner look because i think with this gold on top it will looks so pretty. 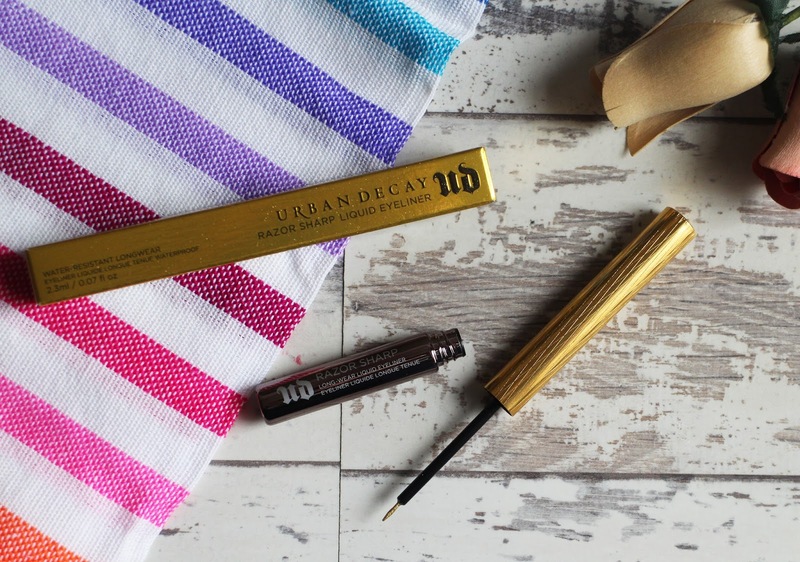 It's also really long lasting; when i tried this out it, it didn't budge at all - which is exactly what you want from your eyeliner at a festival. 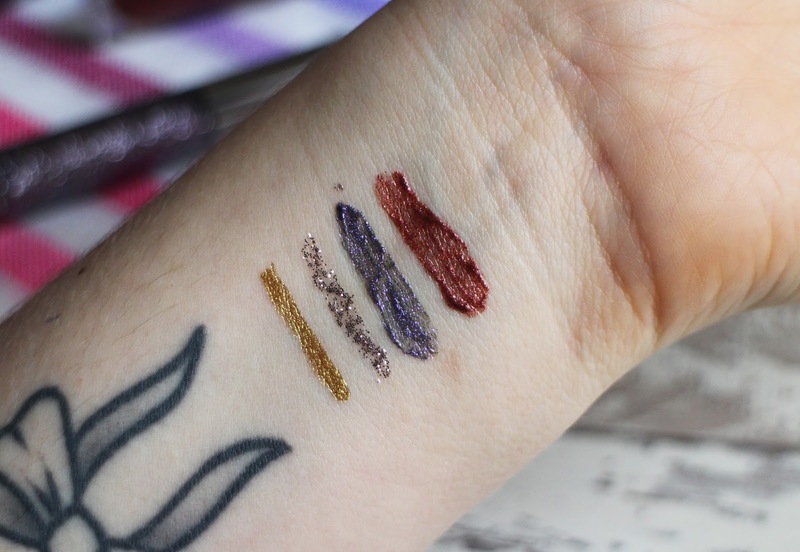 These remind me a little bit of the Collection Glitter eyeliners that they have/used to have (i don't actually know if they're still available) but these have a gel like formula which means it won't separate in the bottle. I really like this kind of product because it's quite versatile, you can use it alone, on top of eyeshadows and you can go subtle or super sparkly (depending on the amount you apply) and it dries really quickly and lasts really well without any fall out. I've actually only tried this as eye liner to get a gist of what the product is like but I'm really looking forward to applying it on top of eyeshadows to get a glam and glitter look. In terms of festival make up, these would be perfect for adding sparkle to your look, as their super easy to use but also because they have peach, cucumber and carrot extract so they'll be quite gentle on the skin so you could even use them around the face as well as on your eyes. 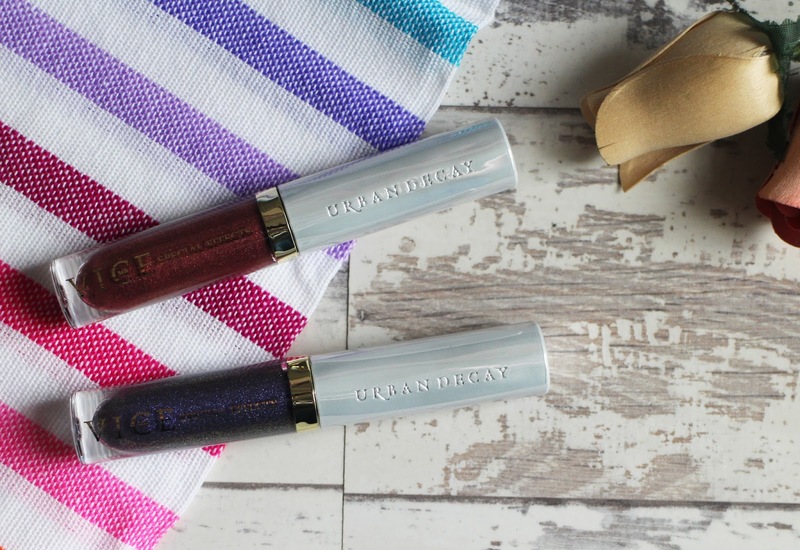 These are such a unique product; I've never seen anything like these before - you apply them on top of any lip colour and it completely transforms you lips. 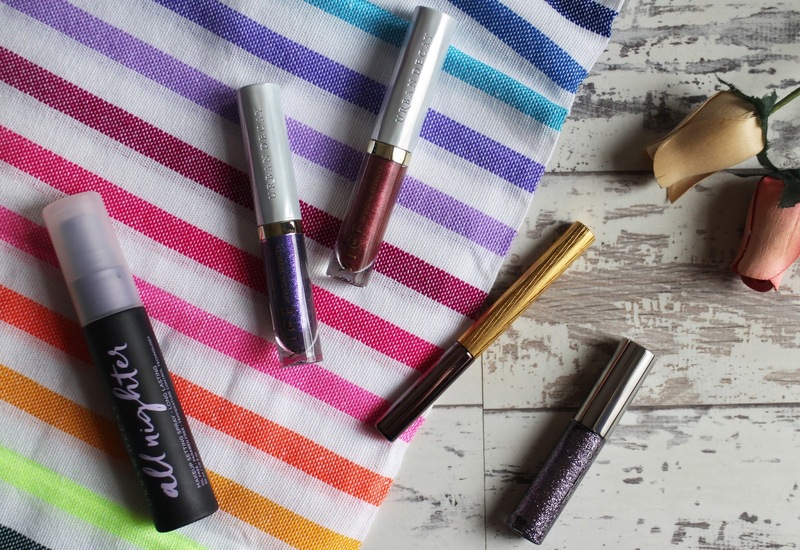 These are super glittery top coats but they dry down to a matte finish so you don't feel the glitter but you still have really shimmery/glittery lips - it's such a unique finish. Personally, i don't love the feel of these on my lips - they make my lips go a little tingly and i don't know if that's normal or not, so i removed it just in case but i imagine these would look amazing at festivals. I did have these swatched on my hands for quite a few hours and after they'd dried down they didn't budge until i washed them off, they didn't even smudge when i swiped my fingers over them either. I can't comment properly on how they wear on the lips but if they are anything like the swatches then you'll be set for hours. I have the shades Bruja (berry with a gold pearl) and the shade Monarchy (bright purple sparkle). I'm going to do a little bit of research to find out if the tingling feeling is normal because i really want to to wear these properly. I already own one of these and i bloody love it so I'm absolutely thrilled to have another one in my collection. 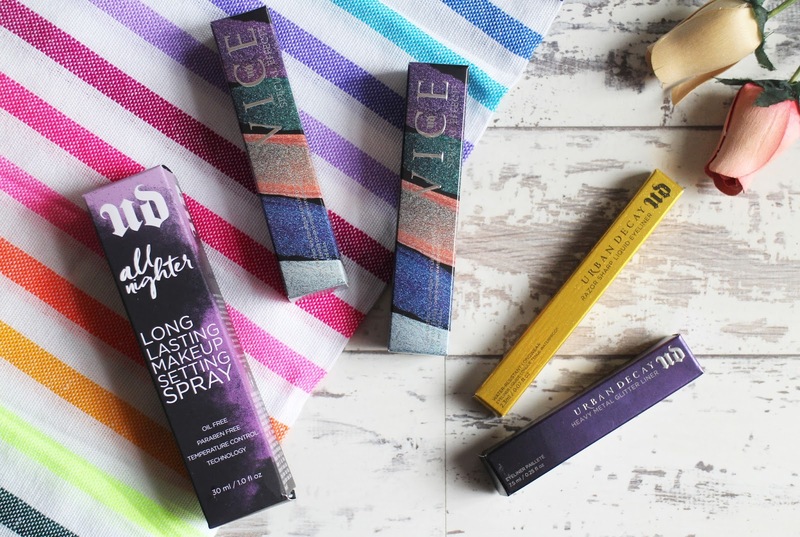 The Urban Decay setting spray is an absolute must have for me and for me, it would be an essential at a festival because it sets everything and keeps all my make up in place and the last thing I'd want to be doing is to be constantly checking and topping up my make up, i don't really like doing that anyway so a product like this that can guarantee to set my make up in place is just ideal and If there was only one item i could recommend out of all I've been sent it would be the setting spray.